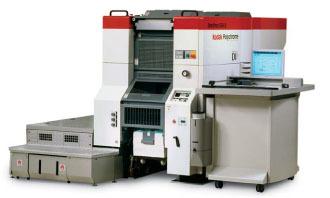 DI printing is the most environmentally friendly method of offset printing. The process is daylight safe requires no chemical processing and since all four plates are imaged in register on press the amount of waste generated is significantly less than other methods of printing. Talk about going green, this baby walks the walk. It’s waterless so we cut our water and fountain solution consumption 60%. We cut our press wash and towel usage 50%. We cut our make ready spoilage from a few hundred down to less than 100 sheets. In some cases down to 50 sheets. All while cutting our makeready times by 2/3.